I apologize ahead of time for such a long post; hopefully you guys don't mind reading my long-winded thoughts. I made it through security without getting searched or anything. 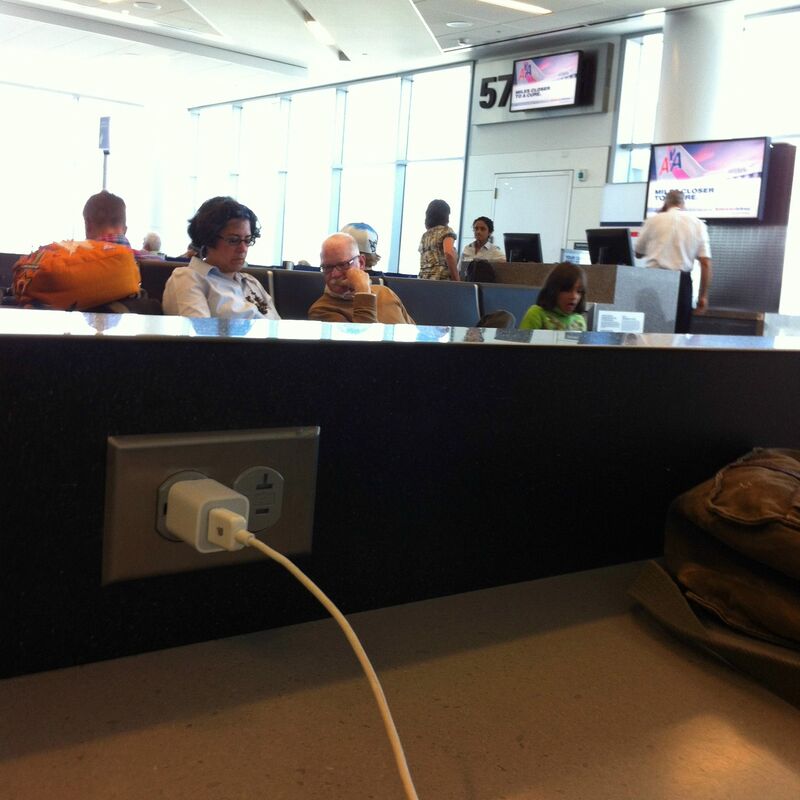 Got to the gate about 45 minutes before my flight, and wasted some time on my iPhone since there wasn't much else to do. Bought two bottles of water for $6.95 (mistake), and waited to board. 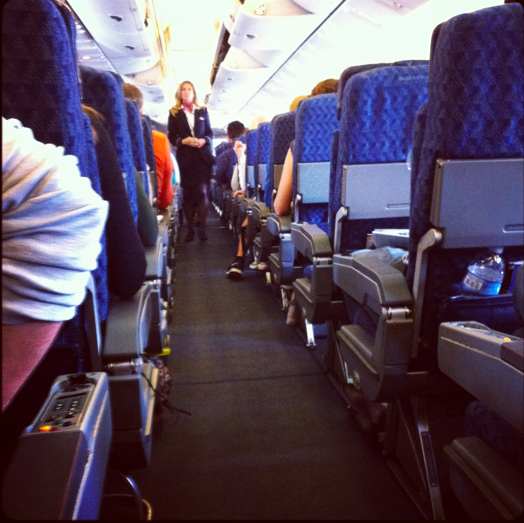 Boarding time came around, and it went by without any turbulence (haha). Cramped seats were waiting for me, but that's what you get when you fly coach. I got also a window seat towards the back of the plane, without any view obstructions from the wing. 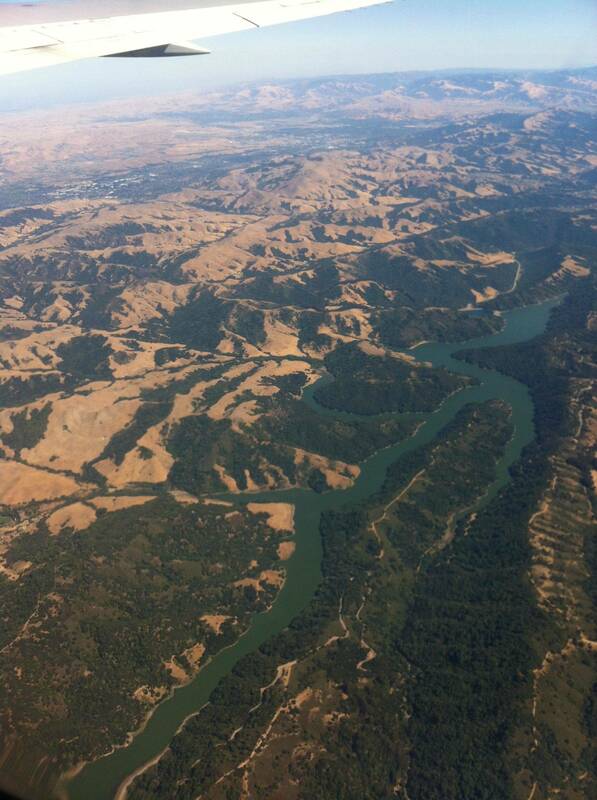 Saw some awesome views of a river in the first ten minutes of the flight. After that, there wasn't much to look at except dry hills, farmland, and clouds. Woke up the next morning at 8:00, and headed over to Tina's Place for breakfast. 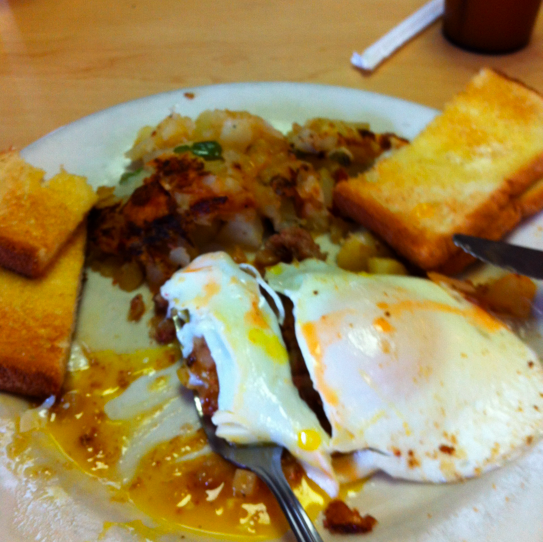 I had the corn beef, hash, and eggs, which was very filling, and pretty tasty. It was a pretty divey place, but that's what I expected and wanted from a cheap breakfast diner. Then I headed over to Gasper Como's barber shop for a shave. 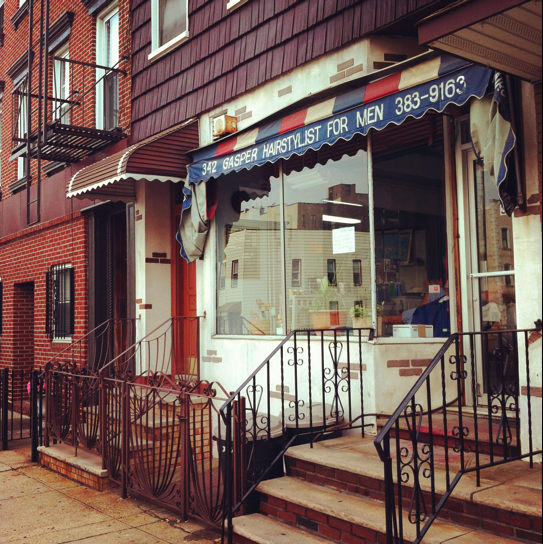 Gasper is from Sicily and has been a barber for 48 years. He said he was shaving faces at age six in the old country. Such a great experience, and the closest shave I've ever had. Some of his regular customers were there with me, and they all seemed to respect Gasper a lot. He was really kind and welcoming. After my shave, I went over to McCarren Park to take a look around before the next thing on my to-do list, which was a last minute cancellation filler appointment with Ron Wells to do the outline of a skull and mandala at Three Kings. Ron did a great job on the design, and killed it on the tattoo. Man, the stomach is one helluva painful spot to get zapped!! Also, judging from other people's feedback on Ron's tattooing pain meter and my past encounter with him, I think he saves all his strength for my tattoos and just punishes the hell out of me; HAHA! Three Kings is a great shop. It was a really cool atmosphere, with all the tattooers and shop help checking out everyone's work, and everybody having a good time. We also made plans to finish my tattoo at the SFO Convention this year. After feeling the pain that is a stomach tattoo, I can definitely be thankful that I split it into two sessions. 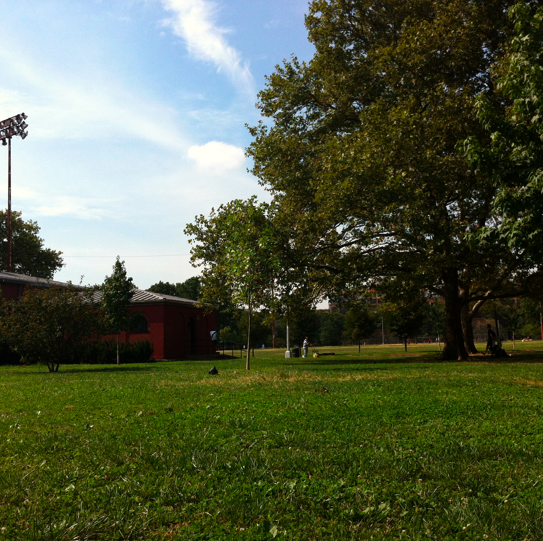 Two shots of McCarren Park. The tattoo Ron made for me. After my tattoo with Ron, I went to get something to eat at GreenStreets Salads. They made me a giant turkey breast, romaine salad with a bunch of stuff thrown in and honey dijon dressing. It was really great. Forgot to snap a picture, though. 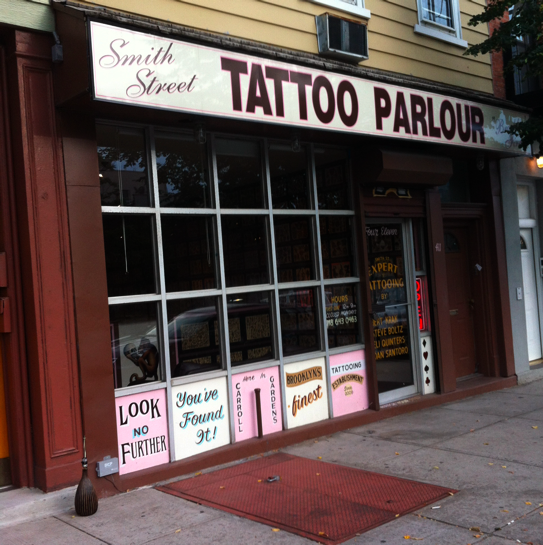 At 5:30 it was time to head over to Carroll Gardens for my Smith Street appointment with Bert Krak. I got there a little early, so I went gift shopping at Olive's Very Vintage for my sisters and mom. I picked them out two sets of earrings (for my little sister and my mom) and one bracelet for my older sister. When the time rolled around to go to Smith Street, I headed over, and was greeted by a friendly, helpful counter guy. I signed a release, gave him my ID, and started to look at the flash on the walls to pick out my tattoo. Bert and Eli came in a minute later, greeted me, then took their pups out for a short walk. I found it really cool that they had shop dogs, and that one was a pit bull and the other, a Staffordshire terrier, as I have two pit bulls in my immediate family, and one Staffordshire that belongs to my cousin. Such awesome dogs. Anyway, there were so many pieces of flash that I liked, so choosing just one was extremely difficult. 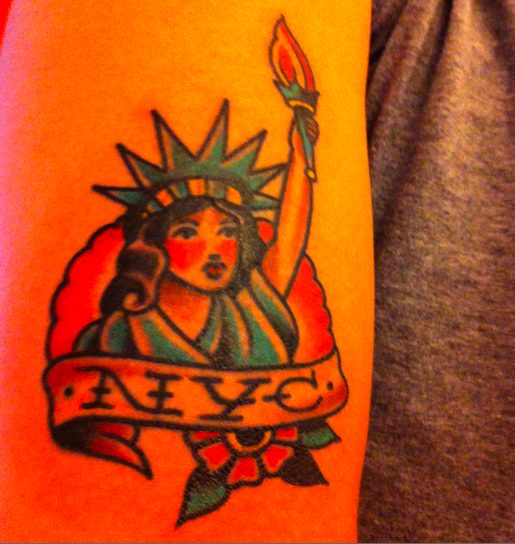 Eventually, I settled on a lady liberty design by Jonesy that was in a manila folder with a ton of other New York themed pieces. Bert got to setting up for the tattoo, and I waited in the front, looking at all the flash. It was a really mellow night, since only Bert and Eli were there, and it had been busy earlier in the day. A few people came in and had questions for the guys. Then I sat down and Bert put the tattoo on me. It was a pretty easy affair, as it was on my arm, a less painful spot for me than the stomach. Bert and I talked about my weekend in NYC, the last SFO Convention, and tattoos. A pair of ladies came in, and one of them was getting an anchor and some initials on her forearm. I had heard her talking with Eli earlier, and she wanted some whacky ideas like having the rope be the letters, having it really detailed, etc., but Eli set her straight for the most part. He did let her have it upside down on her wrist, though. lol. The girls were from Brazil, so I got to hear some about Eli and Bert's recent trip there. One could really tell that the guys working were really good friends, which meant a positive environment to get a tattoo. Overall, it was a good experience going to Smith Street. I hope I can make it back to NYC sometime in the future. I'm kinda bummed that I didn't get a piece that Bert had drawn himself, but he comes to the SFO Convention every year, so I can always get something from him there. 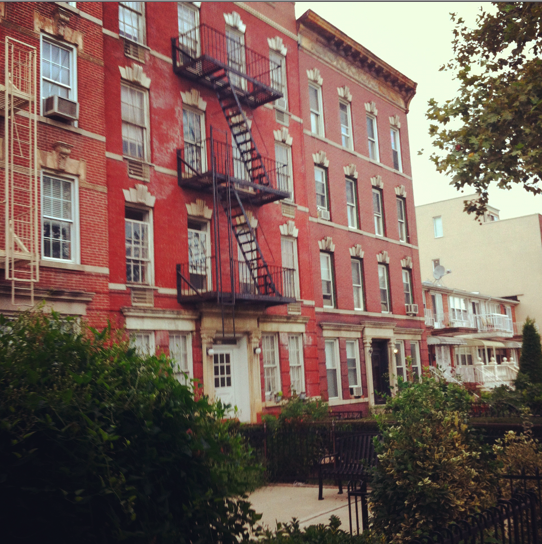 Carroll Gardens buildings were really cool. A nice neighborhood for sure. After that, I went back to my hotel to rest for a while before heading out to dinner at Taqueria El Fogon. 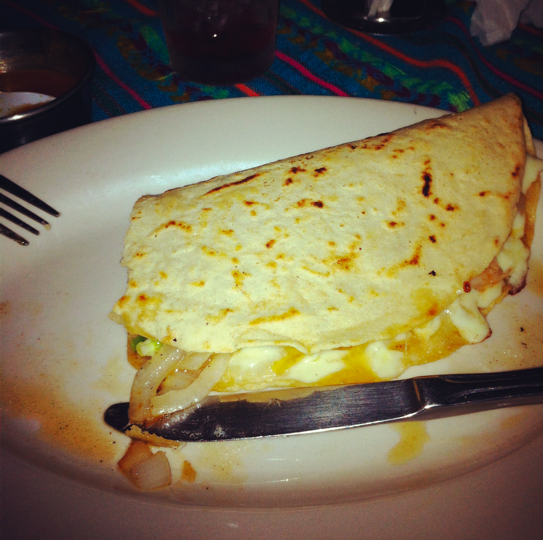 I had a really good shrimp quesdailla with onions and jalapeños and a hibiscus agua-fresca. The waitress was super nice, too. The next day, I woke up around 9:30, and headed over to Whiirlybird for some breakfast tacos. They were amazing! I had one egg and one chorizo and egg. Again, I forgot to get a picture while I was eating. I was a little too into my food, as it were. Then, I went over to Bailey's private studio for my third and last appointment. Bailey met me at the entrance, and we walked up to his awesome little studio. He put on some music (folky rock stuff, as anyone who knows a little bit about Bailey could guess), and showed me the sketch he had planned for me. I really liked the sketch, but he suggested we looked in some reference books of his for some other ideas just in case. It was good that he did, because I saw a vulture that I really liked. Also, an interesting fact: when Ron heard that I had left the type of bird up to Bailey, he said, "Might get a cool turkey vulture," which I liked the idea of a lot. He suggested also that it would really suit Bailey's style. So, when I saw that picture, I just went for it. Bailey got to sketching, and I waited and looked at all the cool stuff in his studio. There were paintings, stencils, animal heads, and really sweet boxes, cases, cabinets, etc. to look at. He showed me the sketch when he finished, and, after I approved, made the stencil. We had a little trouble figuring out a good position for me to sit in for the piece, since it is on the inside of my thigh, but we found a good one after a minute. The tattoo went by pretty quickly, while we chatted about his tattooing career, outlook, etc. and about traveling to either coast of the U.S and dogs. He had some pretty funny stories about weird clients of his in the boonies of Asheville. All told, it was one of the best experiences I have had while getting tattooed. Bailey is a really nice guy. No pictures of Bailey's super secret location. I was pretty beat after that appointment, so I decided to go back to the hostel to rest up. Also, I didn't want to walk around the city with my leg all wrapped up, so I just settled in, rewashed my two tattoos from the previous day, and typed up this blog post. 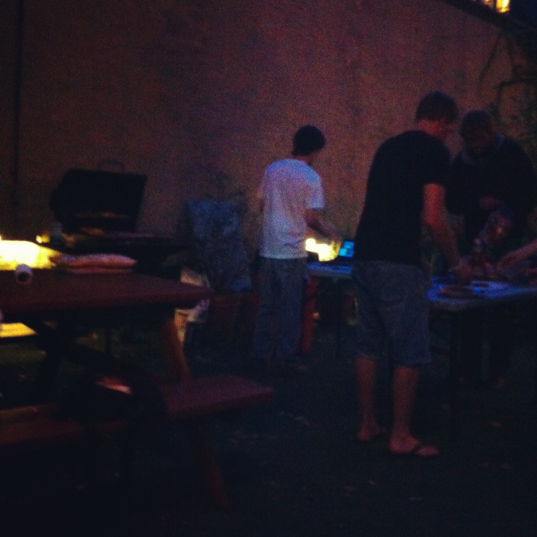 At around 8:00, I went out to the backyard of the hostel, and had a few hot dogs at the free BBQ they were putting on. I was still hungry afterward, and I didn't want to take more than my share, so I went out for sushi at Tomo on Flushing Ave. It was fairly good sushi (although, I will probably always be partial to the sushi places I go to regularly in the Bay Area). It was priced well, though, and the service was great. On Monday, I got up around 9:30, and packed my things for the return flight. 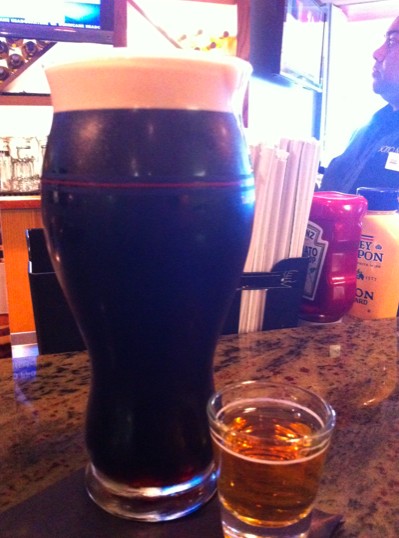 I decided to just head to the airport, and when I got there, went to the airport bar for a few drinks. I had a couple glasses of Guinness from the tap and a shot of Jameson. 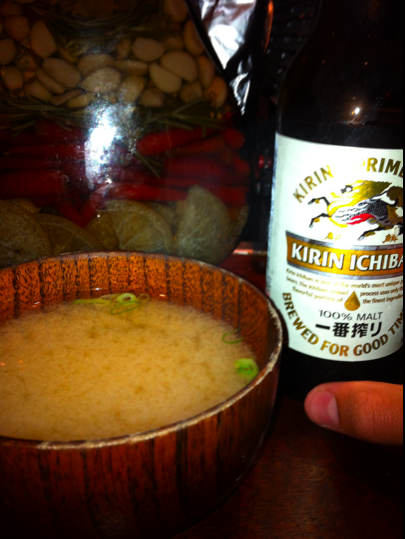 The bartender was really nice, and we had some pleasant conversation about family, dogs, travel, and nationalities. 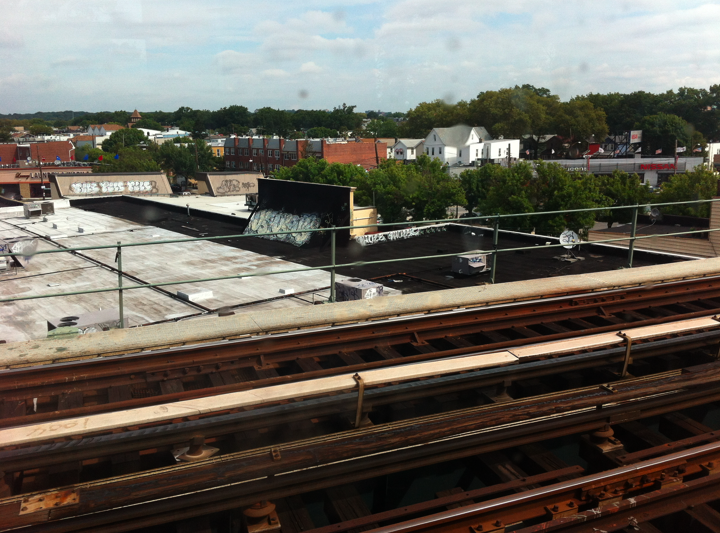 View of Queens from the train to the aiport. At 3:00, I boarded the plane, and we took off around 4:00. There was no in-air WIFI like on the flight into NYC, but I still had some good music to listen to and watched some of the shows on the in-air entertainment. Arrived in SF around 7:00, and headed straight home to my family and amazing pit bull, Luna. She's a sleepy pup after a weekend at my sister's house, where she got to play with her dog. [MENTION=873]Boodah[/MENTION] This was a stellar read! I'm jealous that you got such gnarly tattoos from awesome guys. Thanks for sharing all that Boodah. That was enjoyable, especially since I could relate to going to the park and getting tattooed by Ron Wells at Three Kings last year. Really cool , theres so much I like in this post but Sampson (my staff ) says the best bits Luna . Sounds like a great trip. Thanks for sharing. 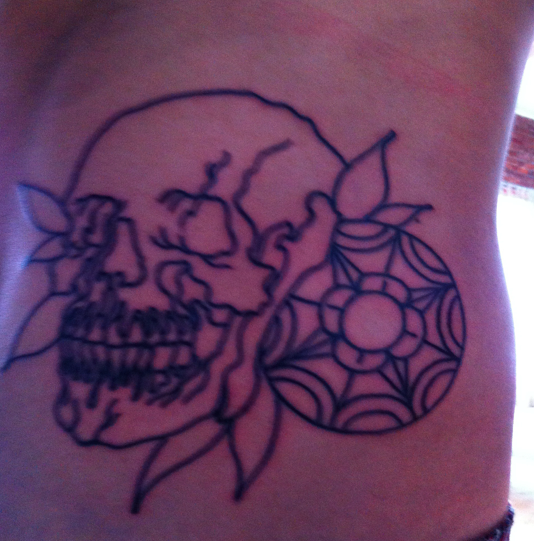 Can't wait to see that RHW skull piece finished. Any pics of your pup, [MENTION=324]kylegrey[/MENTION] ? [MENTION=683]ChrisM[/MENTION] , it's going to be super black with some red. As you may have guessed. Awesome read homie! Glad you had a killer time, got some excellent pieces and fairly good sushi lol. You've definitely held up the standard for LST travel blogs! Dude! Gaspare is my barber!!! 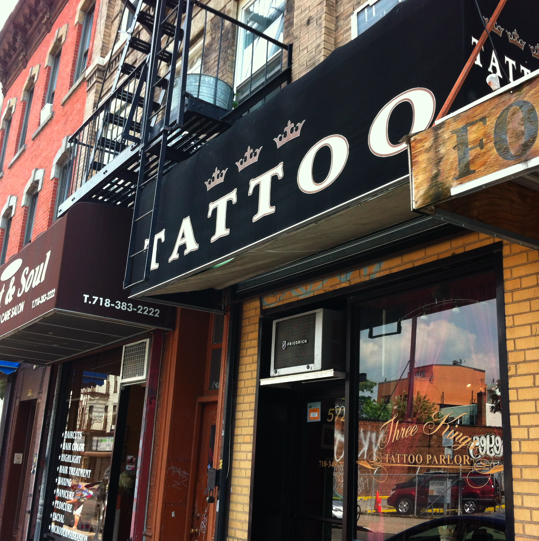 I live right around the corner from there, that guy is great.. Nice tattoo from Ron, too, looks like you had a great trip! 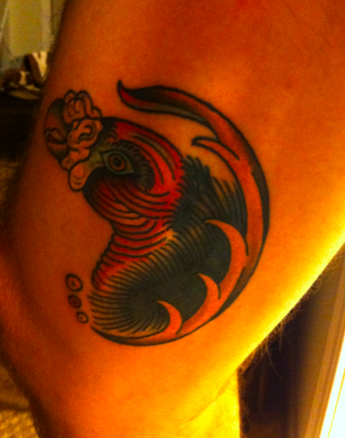 Awesome blog, gets me excited reading about these type of tattoo travels. 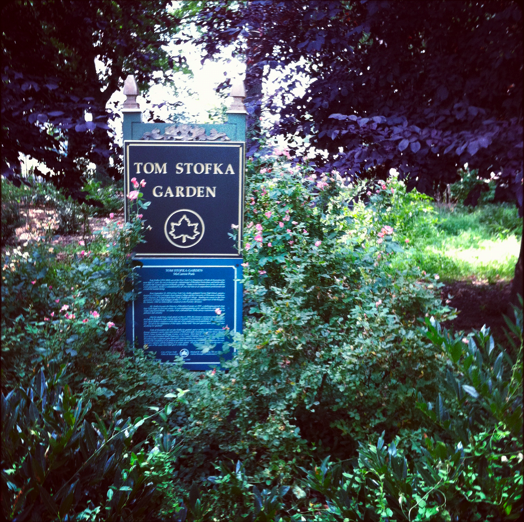 I hope to have my own to NYC fairly soon. Oh, man! Thanks so much for sharing your trip and pictures. It was really fun to read and get to live vicariously through you for a few minutes. I'm all sorts of jealous...that trip sounds amazing and you got tattoos from the exact people I would have on a trip to NY. I look forward to seeing that Ron Wells tattoo all finished! [MENTION=147]gougetheeyes[/MENTION] , that's crazy! He was a super good dude. Just curious, how'd you hear about him? 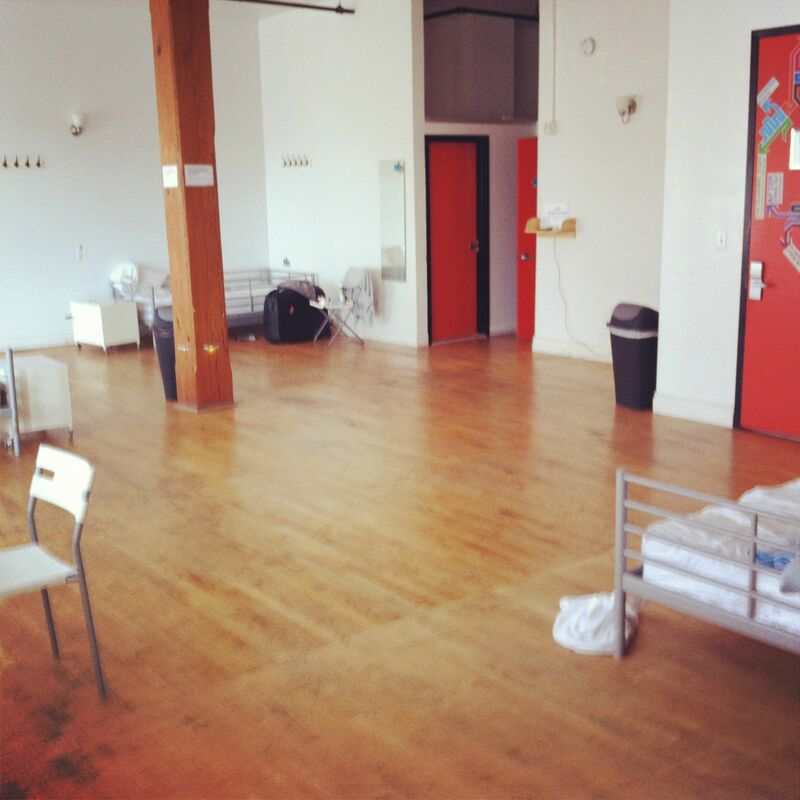 Now, when you're ready for your Chicago trip, forget about all that Hostel stuff! @Boodha Thanks for posting. Great blog. Brings back memories of my trip in June. I got tattooed by Bailey & at Smith Street, as well. [MENTION=147]gougetheeyes[/MENTION] , I looked him up on Yelp. [MENTION=2738]Dan S[/MENTION] , it wasn't as bad as I thought it would be, having other people in the room. I was really only there to sleep, and my bunk mates were quiet. [MENTION=855]jade1955[/MENTION] , I really liked your travel blog (and Iwar's), which is why I decided to write my own.